Our Reading Unit with Mr.DeBerry and Mrs.Berger’s Class. Hurricane Katrina killed people. I know/understand this because I used some important reading techniques that helped me a lot. I learned all this stuff with 4B and Mr.DeBerry. Today in this blog post I will be telling you about all the techniques I used to help me become a better reader and researcher. The first technique that I learned that helped me was when everyone in 4A (my class) and 4B had to write any type of chart about nonfiction in their life. What I mean by nonfiction in your life is writing down things that you see that are nonfiction. For an example some things that I wrote down in my notebook was “ a piece of paper with my schedule on it, the nametag on my math workbook, the title of my friends book, the clock and lots more. This helped me because it helped me understand and notice nonfiction stuff and words. During a tornado warning means that someone has spotted a tornado nearby. The second to last technique that will helped me with reading was how to choose an informational and helpful book. This helped me because I got more information out of some book than others. Or if a book is to easy for me, I could notice it and pick a new book, so I could get more facts. For an example when I was reading books about dolphins, there was an easy book and just right book. The easy book had one sentence on each page and I got very few facts out of it. The other book was just right and had a lot of facts that made sense to me and and I could understand. I knew that the just right book was the right book to choose. The last technique that helped me was learning how to summerize your text. That helped me because when you grow up summarizing text is really important because you sound more interesting than you do if you are reading random facts. My classmates and I used a resource called flipgrid. We talked a little about what we wrote in this post. In this unit, my classmates and I learned how to be a excellent/better reader and researcher. Do you know what an ecosystem is? Well if you don’t it is a place where living and nonliving things interact. For an example in the dessert the animals that interact there are snakes, woodpeckers, insects, owls, rabbits, squirrels, cacti, fox, lizard, Joshua trees, the sun and bacteria. Everything is an ecosystem because everything has nonliving and living things interacting. If there were no ecosystems in the world, there would be dead things everywhere like dead bodies, dead animals, dead plants and so much more. This is why ecosystems are supper important. 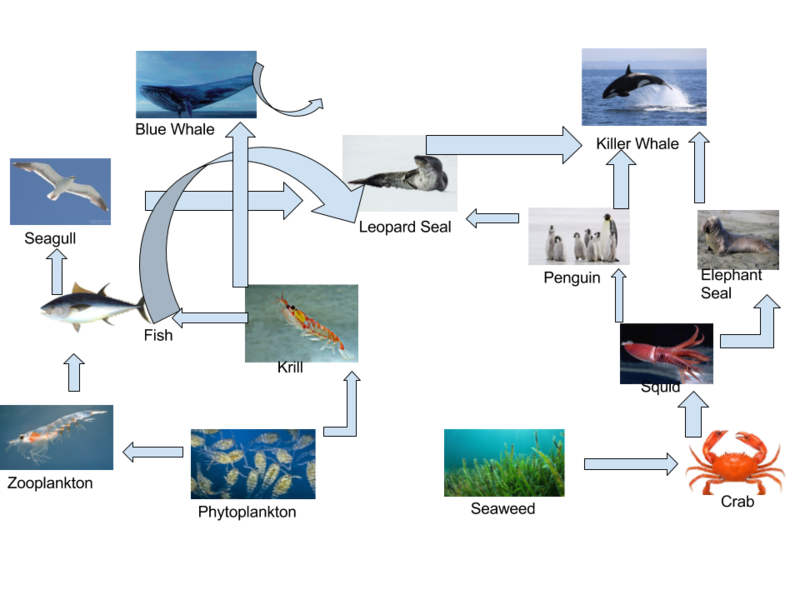 In my ocean food web, I used creatures that live in the oceans and put arrows directing to what they eat. For an example I drew an arrow from seaweed to crab because crabs eat seaweed and crabs live in seaweed. This is called a web because animals can connect to multiple different animals. I included Blue Whales, Killer Whale, Leopard Seal, Fish, Seagull, Krill, Penguin, Elephant Seal, Seaweed, Crab, Squid, Zooplankton and Phytoplankton. All of these animals interact with each other in the ocean habitat.